I didn’t realize how wonderful it is to make your own stock. Besides adding a fantastic depth of flavor to whatever you use it for, stocks are easy to make and significantly cheaper than anything you can buy from the supermarket. 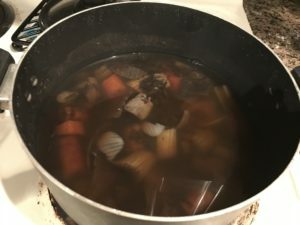 All it will cost you is the price of a carrot, a piece of celery, half an onion, water, and seasonings for a basic stock. Add shrimp shells to make a shrimp stock. Add a leftover chicken carcass (bones, meat, etc) to make a chicken stock. Add the leftover parts of beef bones, meat, etc) to make a beef stock. Add the scrapings from the gills of a portabella mushroom to make a mushroom stock. Best of all, you can leave out salt completely if you need to control your sodium intake, and make it fat-free if you trim the things you put in the pot well enough first. Add all ingredients to a large pot and bring to a boil. Stir to make sure salt and seasonings are blended. If a specialized stock is being made, add those extra ingredients now (example: add chicken bones to the water). Lower the temperature to medium-low and cover pot. Simmer for 4 hours. Pour the stock through a sieve. 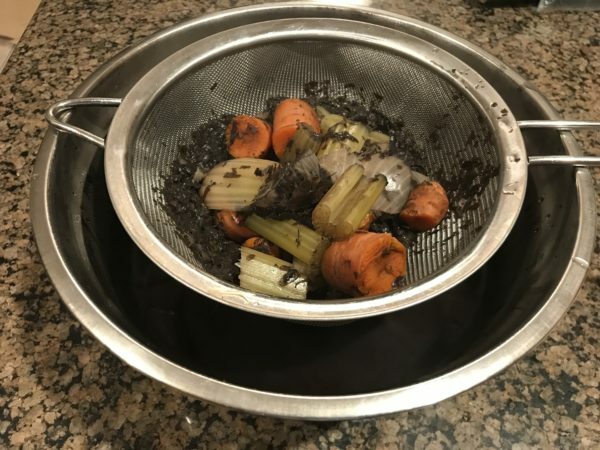 Discard anything caught in the sieve (it will be tempting to try eating the vegetables, but the flavor has been leeched out of them during the simmer). Allow to cool, then place in containers to refrigerate. Use within 1 week. If a fatty stock was made (like chicken), skim the fat from the top of the containers and discard.